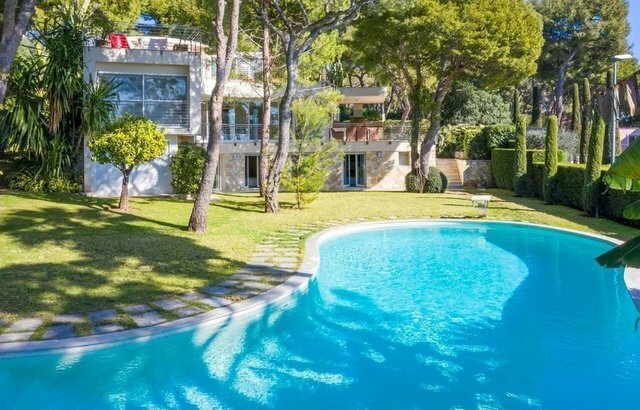 Ideally positioned on St Jean Cap Ferrat this modern design, family house. 450 m² of living space over three floors. Sitting in 1800m² of flat gardens in total peace and tranquillity. You enter into the double sized living room divided into dining living tv and relaxing areas. Also the Master suite can be found on this first level. There is an independent kitchen fully fitted and also a study/office room. On the upper level Is a beautiful bar area leading out onto the spacious terrace overlooking the pool and gardens and with small sea views. Perfect for summer evening dining after a hard day at the beach. On the lower level are further 3 bedrooms, there is also snooker room and sauna area. Out into the gardens there is a lovely oval pool fitting perfectly into the grassed areas and many plants and trees of the region. This property sits close to the Grand Hotel and benefits from a small sea view and ready for immediate occupation.